Originally taking the reigns of the Sound Celebration Chorus as an "interim" Director, Terry soon found out that he wanted to be a part of this wonderful group of ladies on a permanent basis. Now as the official Director he looks forward to seeing just what a group of motivated ladies can accomplish! Terry is no stranger to barbershop. He has been a member of the Barbershop Harmony Society (BHS) for 27 years and has been directing for 25 of them. 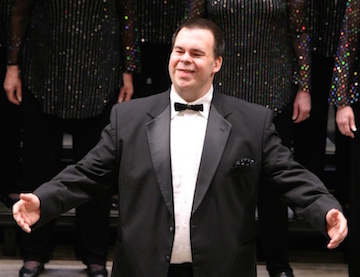 He currently is the Director of the Sound of Illinois Chorus (Bloomington, IL) where he has taken the chorus to International for the last 8 years and placed 14th in 2014. Also, as a quartet singer, he won the Illinois District in 2011 singing tenor with Waldorf Hair Company. His other notable quartet was Wound 4 Sound who placed 3rd in the District two times. He studied Music at Quincy University and had been a part of a number of performing groups over the years. He is married to his wife Christina and has a son named David.